In From Technological to Virtual Art, respected historian of art and technology Frank Popper traces the development of immersive, interactive new media art from its historical antecedents through today's digital, multimedia, and networked art. Popper shows that contemporary virtual art is a further refinement of the technological art of the late twentieth century and also a departure from it. What is new about this new media art, he argues, is its humanization of technology, its emphasis on interactivity, its philosophical investigation of the real and the virtual, and its multisensory nature. He argues further that what distinguishes the artists who practice virtual art from traditional artists is their combined commitment to aesthetics and technology. Their "extra-artistic" goals -- linked to their aesthetic intentions -- concern not only science and society but also basic human needs and drives. 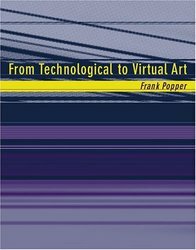 Defining virtual art broadly as art that allows us, through an interface with technology, to immerse ourselves in the image and interact with it, Popper identifies an aesthetic-technological logic of creation that allows artistic expression through integration with technology. After describing artistic forerunners of virtual art from 1918 to 1983 -- including art that used light, movement, and electronics -- Popper looks at contemporary new media forms and artists. He surveys works that are digital based but materialized, multimedia offline works, interactive digital installations, and multimedia online works (net art) by many artists, among them John Maeda, Jenny Holzer, Brenda Laurel, Agnes Hegedus, Stelarc, and Igor Stromajer. The biographical details included reinforce Popper's idea that technology is humanized by art. Virtual art, he argues, offers a new model for thinking about humanist values in a technological age. Frank Popper is Professor Emeritus of Aesthetics and the Science of Art at the University of Paris VIII. He is the author of Origins and Development of Kinetic Art, Art, Action, and Participation, Art of the Electronic Age, and other influential works on art and technology.